The Gold Quoin Press was founded in 2008 for the purpose of exploring letterpress printing, publishing of worthy texts and images, and exploring the world of book arts. The press collaborates with writers and designers to create unique books and prints. It hosts an open studio for members of the community interested in exploring printing and book arts. 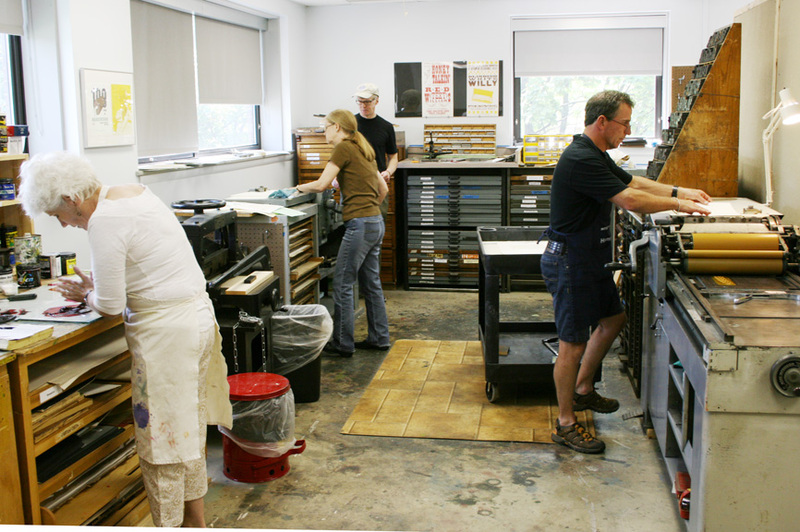 It holds workshops on letterpress printing and book binding several times during the year. To learn about upcoming events and to find out days and times the shop will be open, contact Robert Rowe. To be added to our email list, send your name, telephone number, and email address to rowe@bradley.edu. Housed currently at Bradley University in Heuser Hall, the press is dedicated to education, preservation and publication. Along with encouraging and assisting individuals with their own projects, the group engages in group collaborative projects. In the past, these have included books such as Directions Home (2013) consisting of poems inspired by Peoria by Peoria’ s own poets, “A Great Day for a Run (2012) and “Unclose the Door (2012) by poet Madeleine Wiseman. It also includes such a projects as a fundraising poster for elementary school arts classes inspired by by children’s drawings. .
We wish to thank the generous support of our members, Mohawk Paper Company, and Prairie Center of the Arts (Joe and Michele Richey) and Bradley University.